Nitra is a city in western Slovakia, situated at the foot of Zobor Mountain in the valley of the river Nitra. Your day-by-day itinerary now includes Nitra Castle as well as Black Death Column. You'll discover tucked-away gems like ONE Fashion Outlet Voderady and Church of St. Helena. 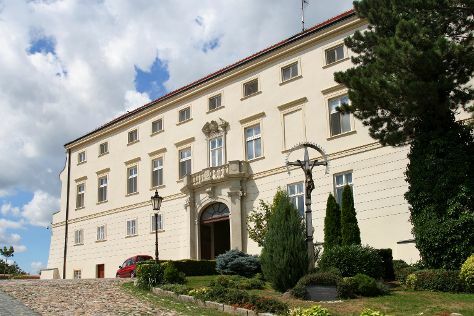 Your cultural itinerary includes sights like Karpatská perla and Diecezne Muzeum. Explore Nitra's surroundings by going to Penati Golf Resort (in Senica) and Fedor Malik & Son (in Modra). To see maps, reviews, and more tourist information, you can read our Nitra vacation builder. If you are flying in from United States, the closest major airport is M. R. Štefánik Airport. October in Nitra sees daily highs of 60°F and lows of 44°F at night. Cap off your sightseeing on the 13th (Fri) early enough to travel back home.